On Christmas Eve, two American astronauts spent the day in space, working to fix the cooling system on the International Space Station. Down here on Earth, though, the celebrations are mostly confined to land and sea. 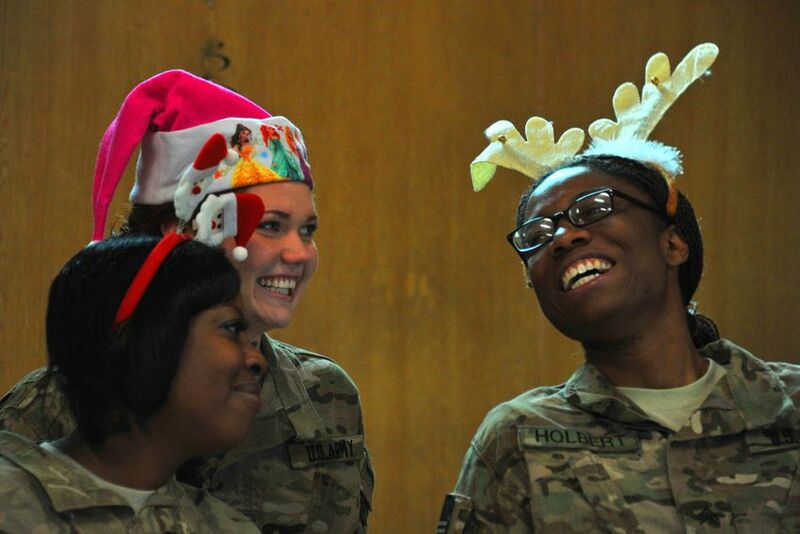 From soldiers sharing a special meal in Afghanistan to Santa waterskiing in Maryland, people and cultures around the world observe Christmas Day with their own sets of traditions. Some of these traditions are centuries old, like gathering in the little town of Bethlehem; others were brought on by circumstance this year, like families in Tacloban, Philippines, finding Christmas joy amid the post-Typhoon Haiyan destruction. 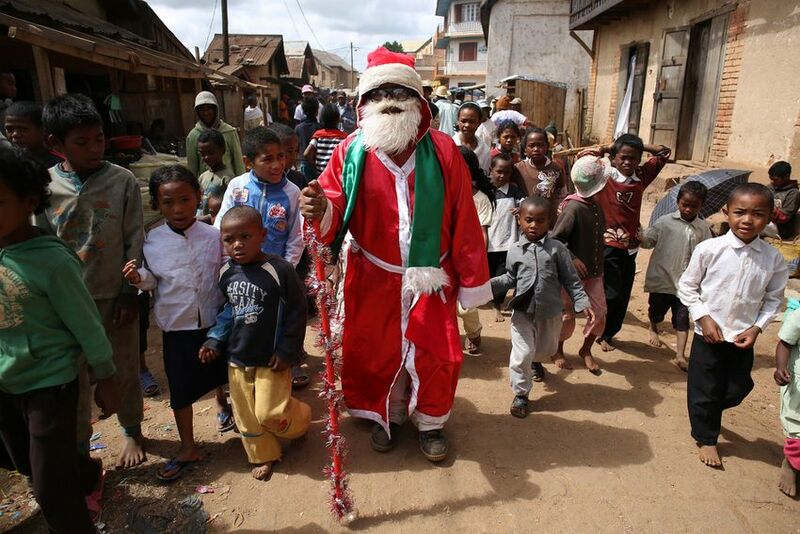 Our collection of Christmases, below, traverses the globe in 28 photos. 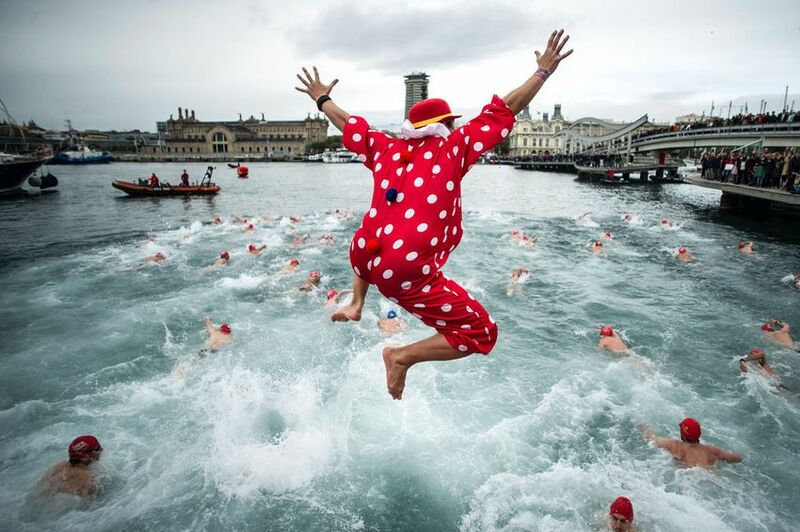 During the Barcelona Traditional Christmas Swimming Cup, competitors swim across about 650 feet of water in the Old Harbor of Barcelona on Christmas Day. The event was launched in 1908, and has only been suspended three times since, during the Spanish Civil War in 1936, 1937 and 1938. 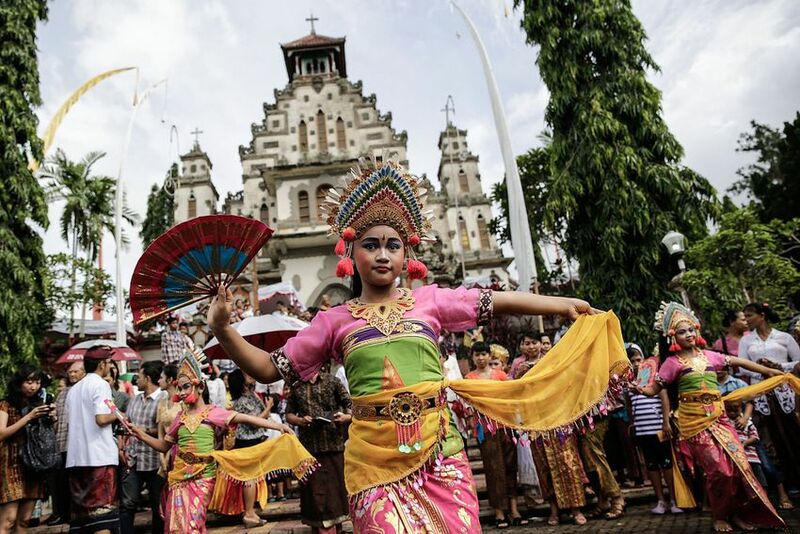 Indonesian Catholic dancers perform traditional Balinese dance during Christmas celebrations in Bali, Indonesia. The village of Palasari comes alive during the Christmas period with extravagant celebrations, with great attention paid to holiday ornaments and decorations. Men and women dress up in their finest traditional costumes. Antananarivo, the capital and largest city in Madagascar, days after the run-off presidential election there. 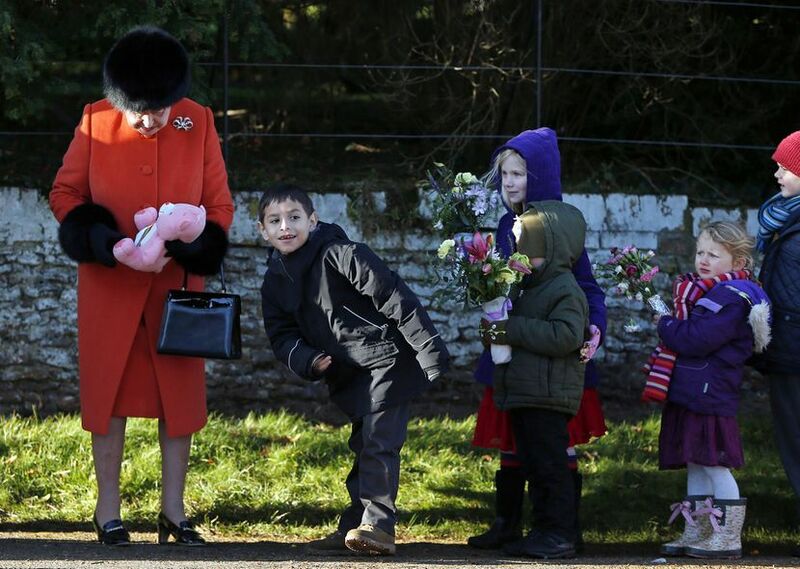 Children line up to give gifts and flowers to Queen Elizabeth II, at left, following a Christmas Day church service. 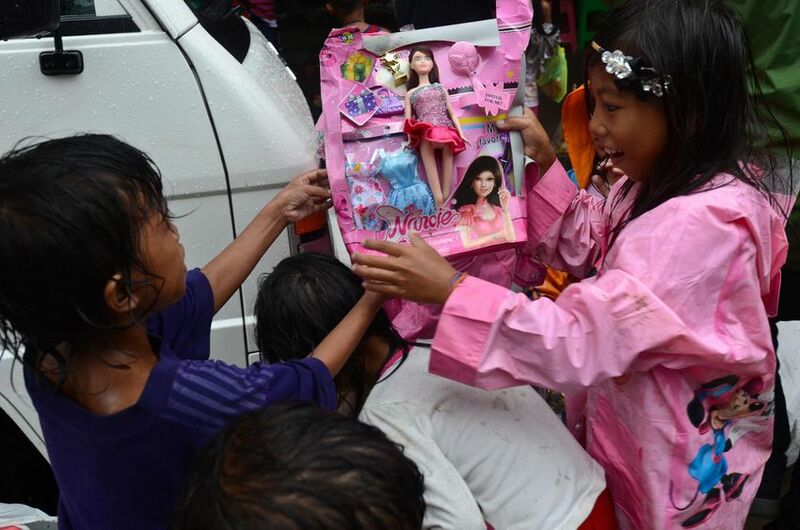 A girl discovers a doll discarded by a grocery store on Christmas Day in Tacloban, one of the areas hit hardest by Typhoon Haiyan in November. Haiyan has been described as one of the most powerful typhoons ever to hit land, leaving thousands dead and hundreds of thousands homeless. With Christianity the predominant religion in Philippines, the people of Tacloban will try to find a way to celebrate Christmas despite the incredibly difficult circumstances. 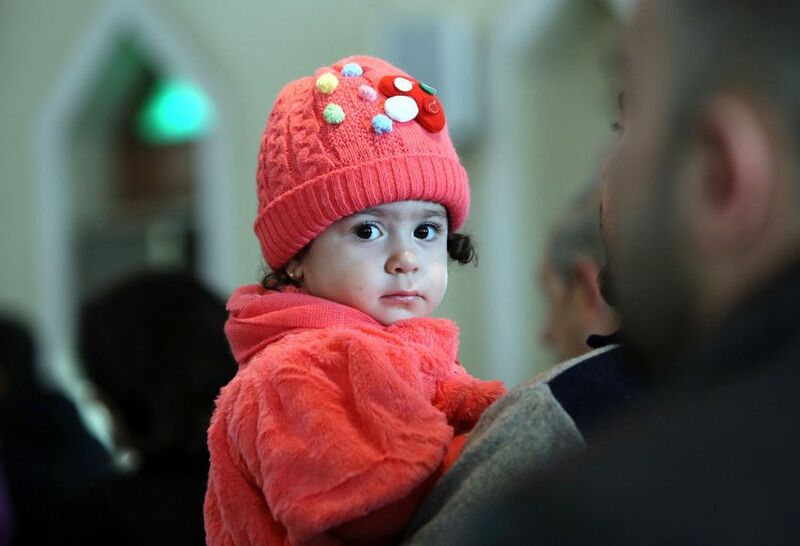 An Iraqi Christian child sits in her father’s arms as she attends a Christmas service in Baghdad. Christians in the Middle East are being “attacked and massacred” and driven into exile, the leader of the world’s Anglicans Justin Welby said in his first Christmas sermon. 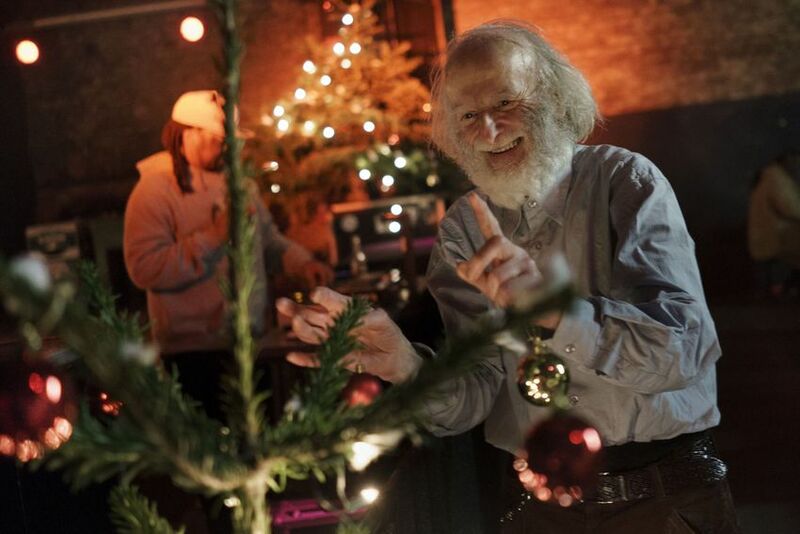 A man hangs red Christmas ornaments on a tree at the “Weihnachtsfest fuer alle” (“Christmas celebration for all”), a Christmas celebration for the homeless at the YAAM nightclub on December 24, 2013 in Berlin, Germany. Approximately 100 homeless people attended the event, which included a show and a three-course dinner and was organized by the Kaelte Nothilfe charity. 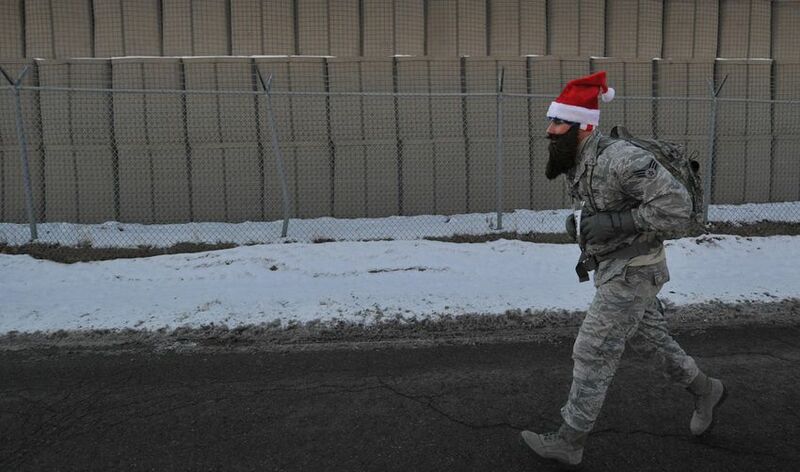 A U.S. soldier takes part in the Christmas 5-kilometer run at the U.S. Transit Center of Manas. 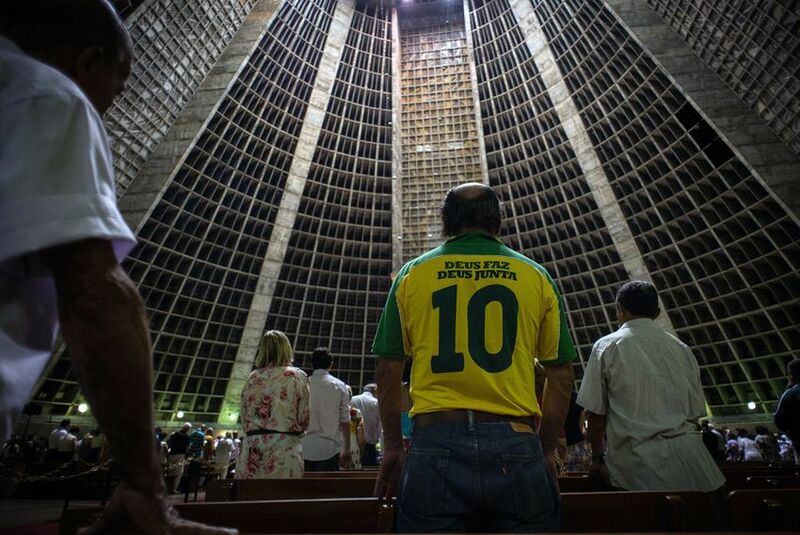 Parishioners attend Christmas Eve mass at the Cathedral of St. Sebastian in Rio de Janeiro, Brazil, on December 24, 2013. 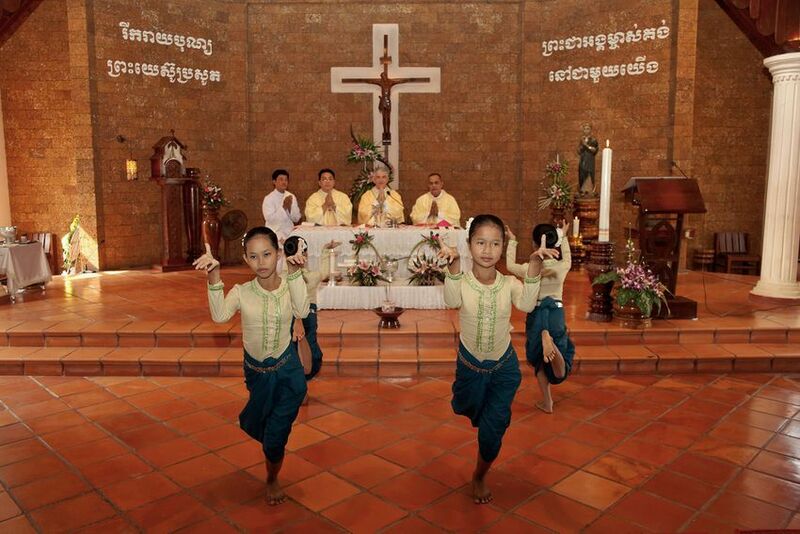 A group of young dancers perform a dance during Christmas Day mass at a church in Battambang, Cambodia. The parish at Battambang dates back to 1790 when the Catholic community first arrived; now it serves around 1,000 Catholics and 600 families. 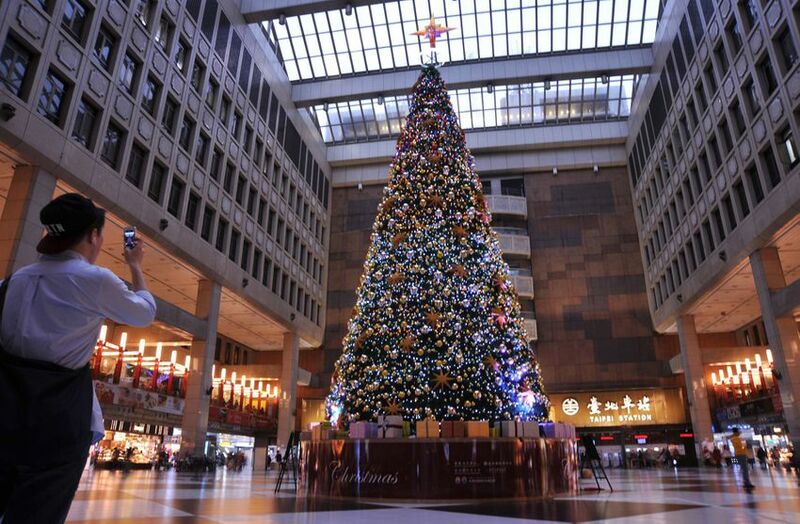 A man takes photos of a Christmas tree in the Taipei Main Station. 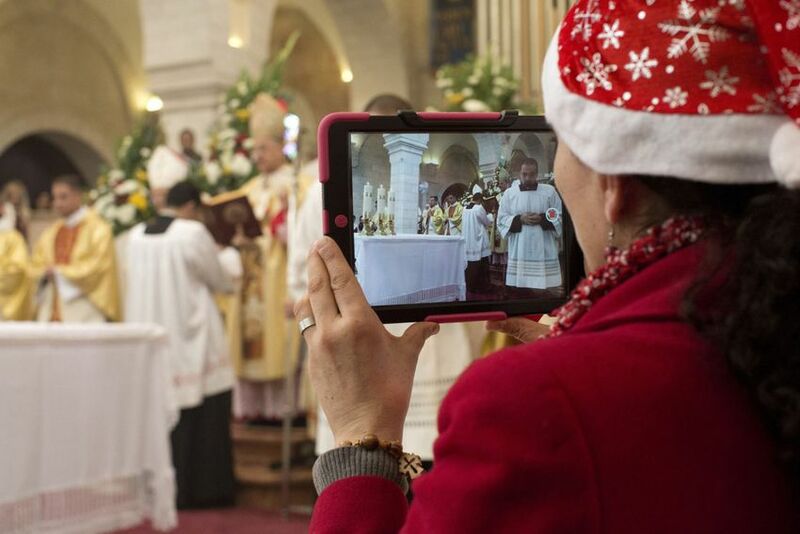 A woman uses her iPad to snap photos during a Christmas mass in Bethlehem, West Bank. A gold star embedded in the floor at this church marks the spot where it’s believed Jesus was born. 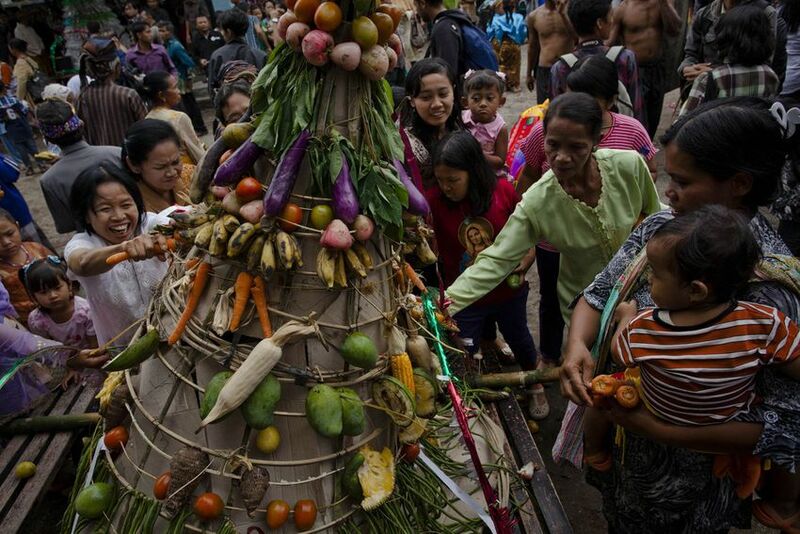 Indonesian Javanese Christians jostle for the gunungan, a group of vegetables arranged in the shape of a mountain, during the rainwater ritual part of the Christmas celebration in Klaten, Central Java, Indonesia. The ritual is performed in gratitude for rain water. Although only 80% of the population in Indonesia identify as Christian, Christmas is a national holiday there. 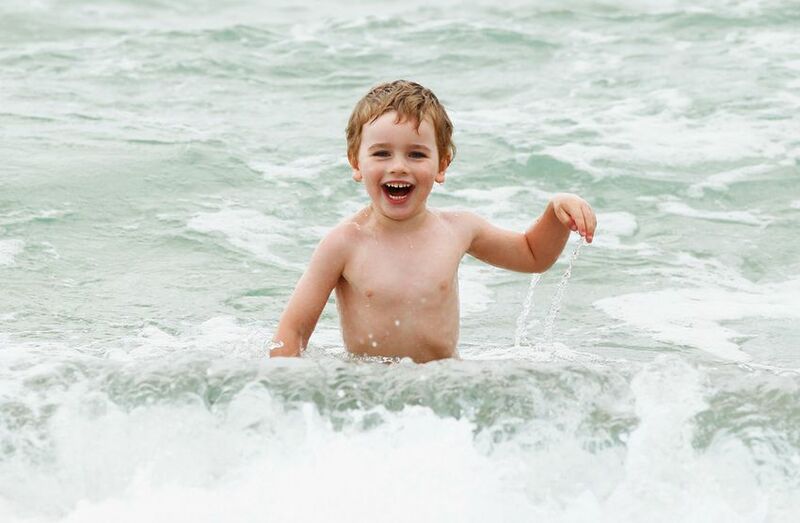 Archie Mathews of Sydney, Australia, frolics in the shallow water at Bondi Beach on Christmas Day in Sydney, Australia. Bondi Beach has long been a popular place for tourists and Australians alike to celebrate a hot Christmas Day. 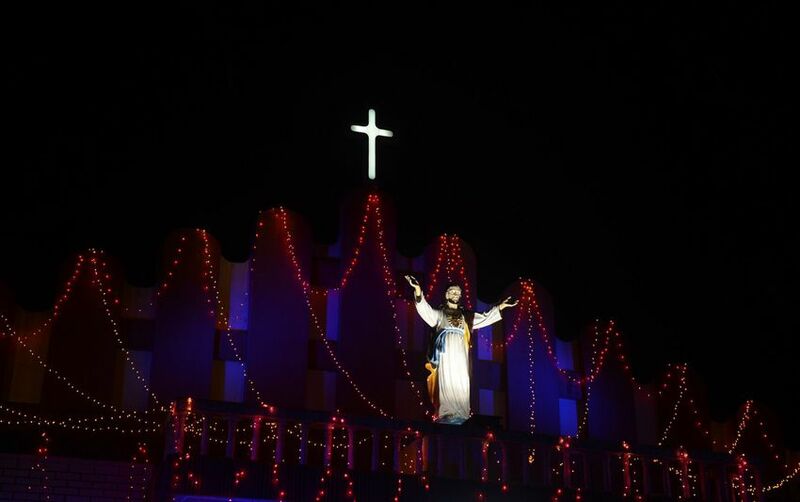 This picture taken on Christmas Eve shows the illuminated Saint Mary’s Church in Siliguri. Christians comprise just more than 2% of the billion-plus population in India (with Hindus as the majority), but Christmas is still celebrated with much fanfare and zeal throughout the country. 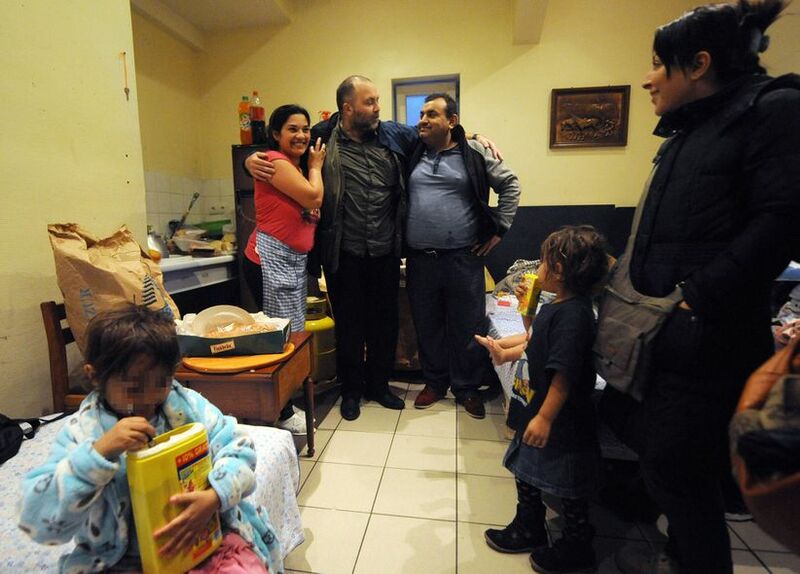 French doctor Christophe Lamarre (center) poses with Roma people on Christmas Eve in northern France during an afternoon tea. Lamarre has hosted about 50 and 80 Roma people since French police dismantled their camp in September. 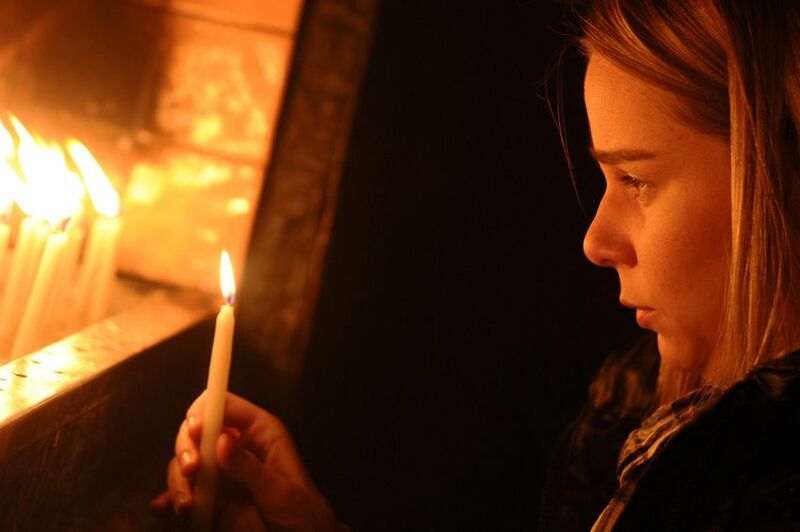 A woman lights a candle in Saint Anthony of Padua Church in Istanbul on Christmas Eve. 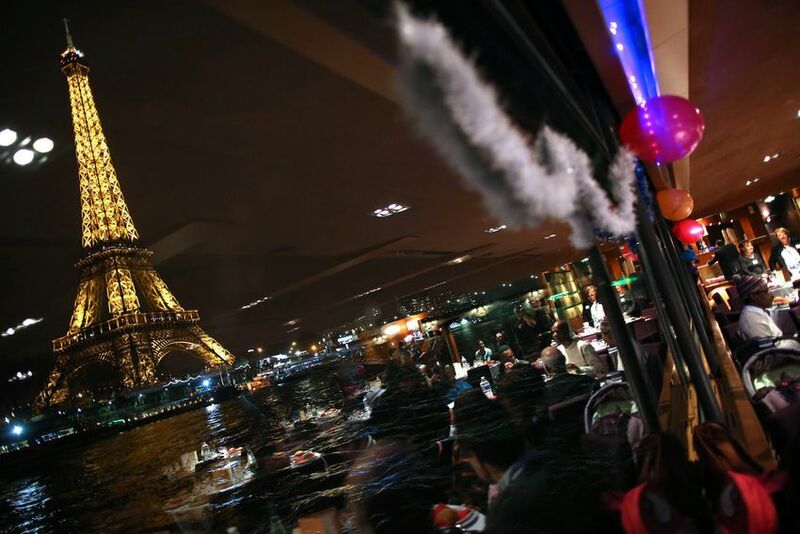 The Eiffel Tower as seen from a boat on the Seine River in Paris as people attend a Christmas Eve dinner organized by French nonprofit Secours Catholique. 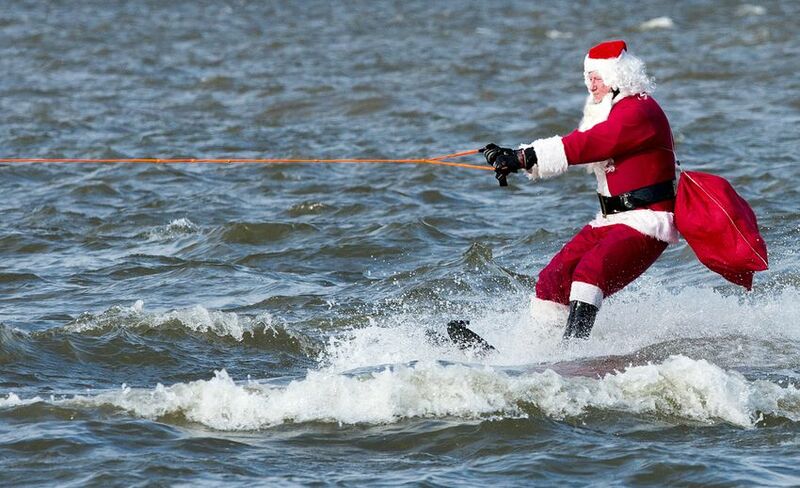 The waterskiing Santa heads down the Potomac River on Dec. 24 at National Harbor, Maryland, near Washington, D.C. 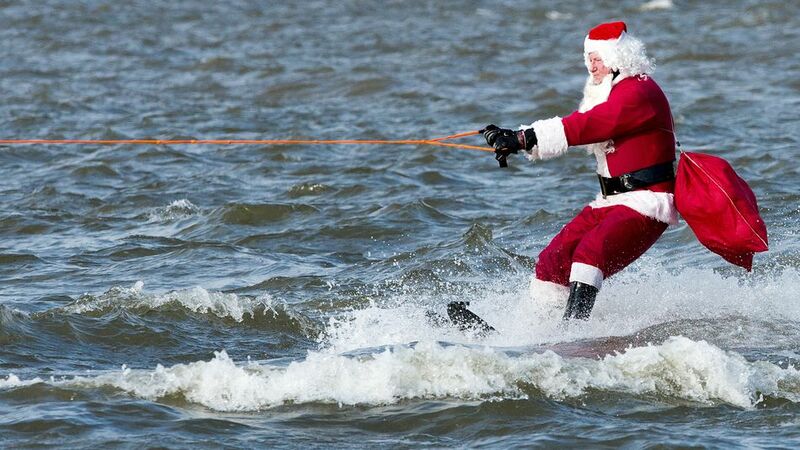 The group of volunteers are celebrating their 28th anniversary of the event that also has kneeboarding reindeer, flying elves, the jet-skiing Grinch and Frosty the Snowman. 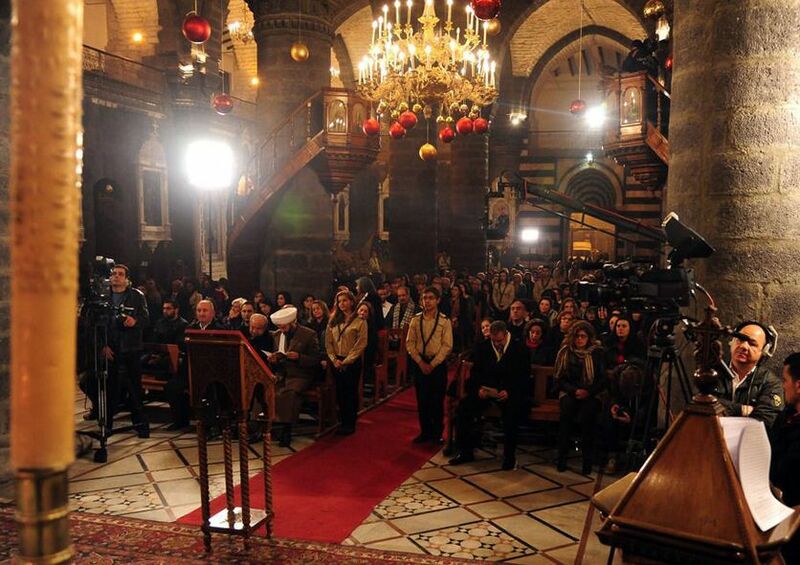 Syrians gather for Christmas Eve celebrations and prayers in Al-Zeitoun Roman Catholic Church in Damascus on December 24, 2013. 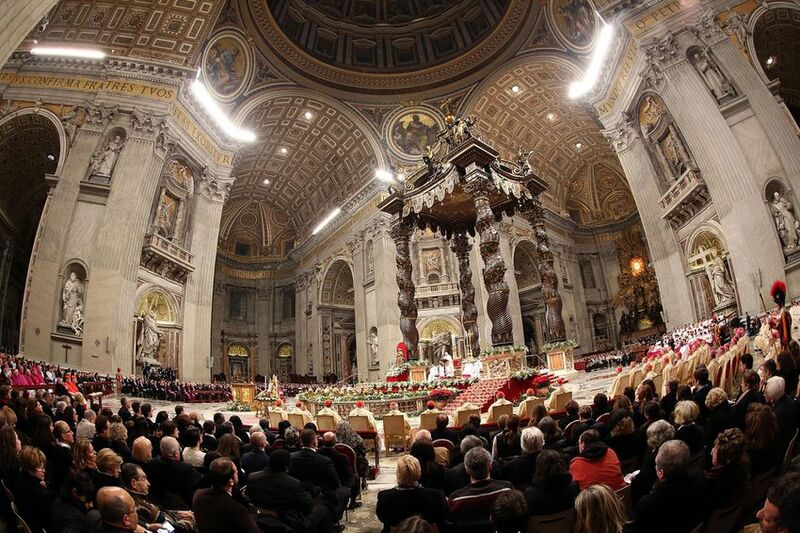 A view of St. Peter’s Basilica during the Christmas night mass lead by Pope Francis on December 24, 2013 in Vatican City, Vatican. Pope Francis celebrates the first Christmas of his pontificate. Soldiers during a special meal on Christmas Day at a military base in Kabul. NATO forces are withdrawing from Afghanistan after more than a decade of fighting the Taliban, but negotiations have stalled on a security accord that would allow some U.S. and NATO troops to stay after 2014. 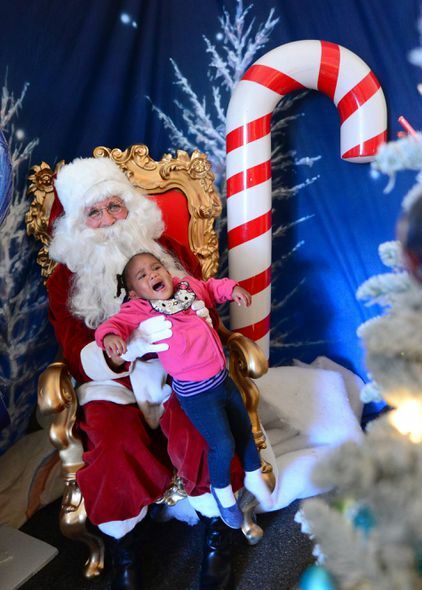 Omiah Panton, 18 months, cries for her mommy who placed her on Santa’s lap inside a Winter Wonderland tent at a Christmas Eve meal hosted by the Los Angeles Mission on December 24, 2013 along Skid Row in downtown Los Angeles, California. The LA Mission was established in 1936 as a soup kitchen and Christian outreach to the homeless and today, with the help of many volunteers, a Christmas celebration was made possible for the impoverished and marginalized members of society. A view of Manger Square and the Church of the Nativity as people gather for Christmas Eve celebrations in the biblical West Bank city of Bethlehem, believed to be the birthplace of Jesus Christ. 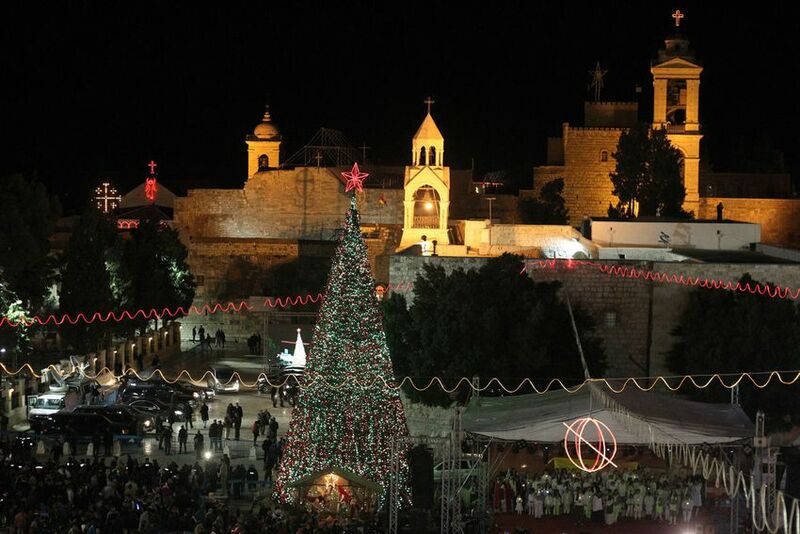 Thousands of Palestinians and tourists flocked to Bethlehem for Christmas this year. 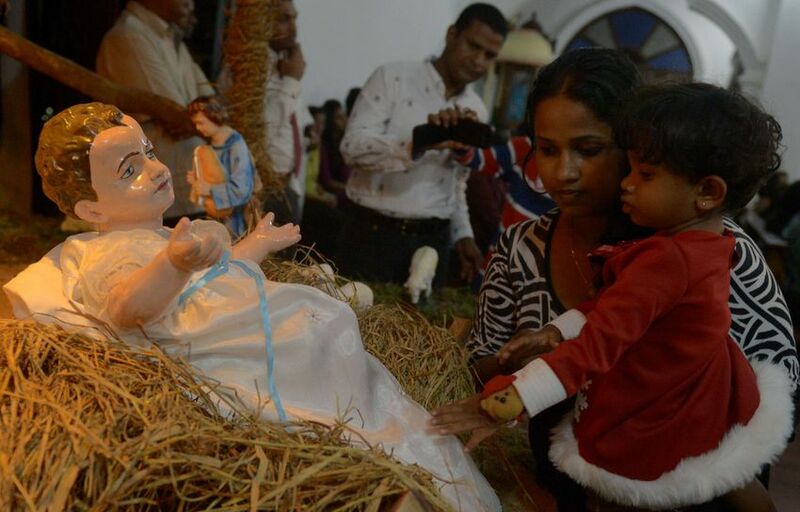 Christian devotees gather around the nativity scene depicting the birth of Jesus during a Christmas mass in Colombo early on December 25, 2013. Christians account for some 6 per cent of Sri Lanka’s 21 million population. 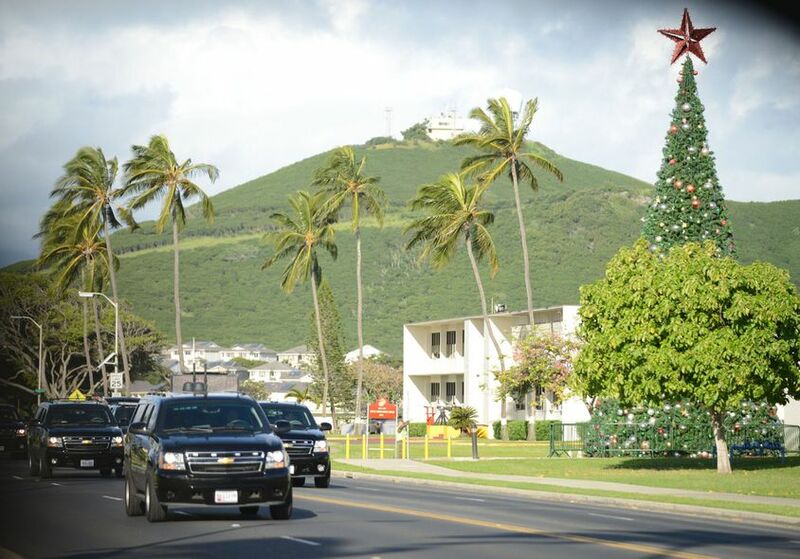 U.S. President Barack Obama’s motorcade drives past a decorated tree as it travels back from his morning exercise routine at Marine Corps Base Hawaii on Christmas Eve in Hawaii. In a symbolic gesture, Obama signed up for the federal health care insurance program on Dec. 23. The first family will be vacationing in the Hawaiian Islands until Jan. 5. 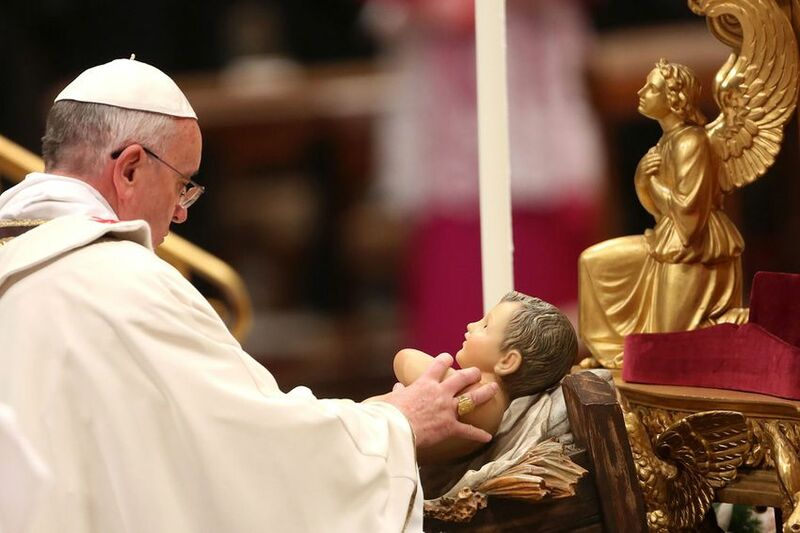 Pope Francis holds the crib as he attends the Christmas night mass at the St. Peter’s Basilica on December 24, 2013 in Vatican City, Vatican. 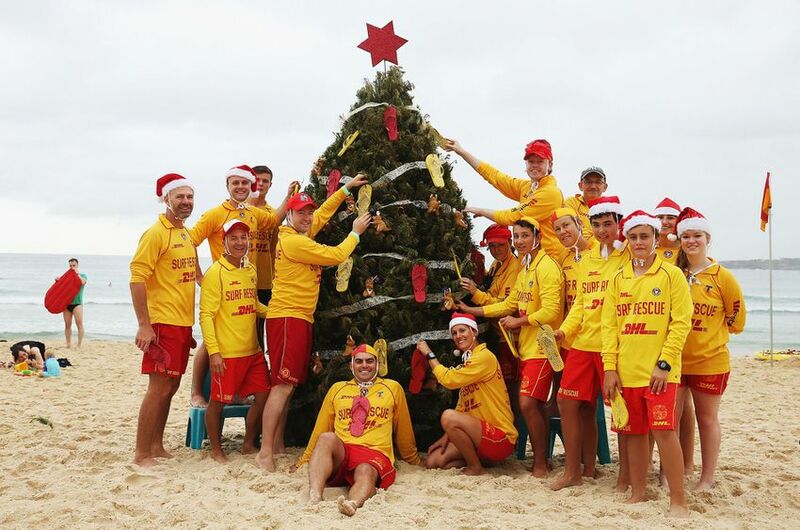 Bondi Lifeguards pose in front of their Christmas tree at Bondi Beach on December 25, 2013 in Sydney, Australia. Bondi Beach has long been a popular place for tourists and Australians alike to celebrate a hot Christmas Day.